After the most exhausting and scary island visit to Ko Phi Phi, we managed to get Eric to Hat Ton Sai for a bit of recooperation. He was struck with a very bad case of food poisoning and it would take an entire week before he felt good again. Thankfully, he did get better and we got some great footage of the wonderful scenery in the rock climbing village of Hat Ton Sai! After leaving Ko Phi Phi, we arrived at a strange place called Hat Ton Sai. The scenery was gorgeous! This picture really captures how Hat Ton Sai felt when we arrived. The tide was out and it exposed all the rocks under the water. There was an orange tint on everything and it felt like we had landed on Mars. The crags on the island were overwhelming! This was the hotel where Eric recooperated from the watermelon attack of Ko Phi Phi! And they are right, somewhere is next to Railay beach! An extremely familiar site! We would basically sit out on the patio when Eric wasn't sleeping! We would play cards and drink banana shakes! Lots of cute little animals running around! Hat Ton Sai is a rock climbing destination. We got to see many people show off their skills! After almost a week, Eric's body finally started to conquer his sickness! We went out to the water to celebrate with some exploration! He's looking super better now! Don't worry! Even though it looks like a skull, it's just a rock! Beautiful! It was so good to see him feeling better! 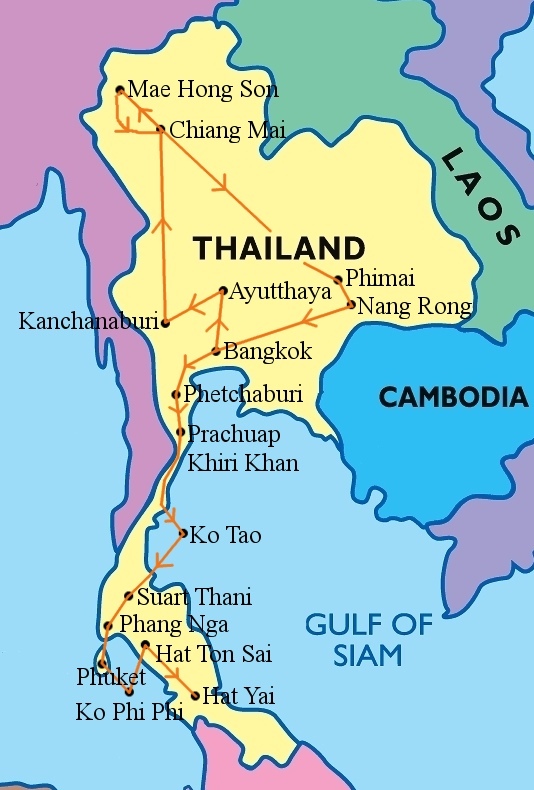 This was our route through Thailand!